Born 19 March 19951 in Fukuoka, Japan. Studied Middle Eastern Languages and literature at Osaka University of Foreign Studies, then at Rijks Universiteit to Leiden, the Netherlands. Lived in the Netherlands (1973-1978), then in U.K. (1978-1983) working for, among others, Rotterdam Office of the Osaka Prefectural Government, the Netherland Tourist Office, and a Japanese tour operating company. Travelled widely in Europe both on business and for pleasure. In 1983, returned to Japan to join the Tokyo office of the City and Port of Rotterdam. One of the major projects untertaken was to organise a Japan Festival in Rotterdam in 1984, whose events included a Bonsai exhibition. Had the first introduction to Bonsai there and made an acquaintance of my future master-to-be, late Terukichi Kato, the younger brother of Saburo and Hideo Kato. him at his nursery, Masei-en Shiten. 1n 1991, completed the training obtaining a diploma from the Japanese Cooperative of Professional Bonsai Nurseries. 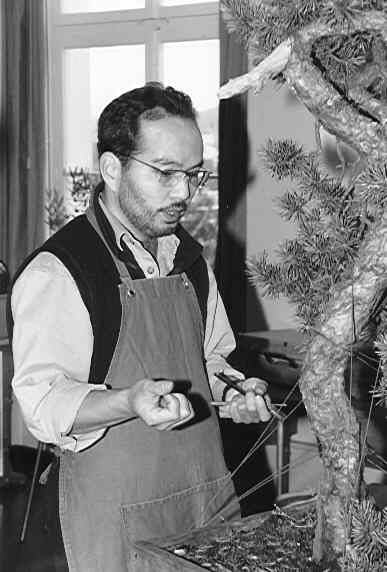 In 1991, returned to U.K. to pursue professional Bonsai career in Europe. Since 1992, appointed the chief instructor at the "Universita di Bonsai" at Parabiago, Milan for their 3-year Bonsai courses. In 1993, awarded Gold medals at the IGA, International Garden Show held in Stuttgart for the Bonsai exhibition jointly produced with the client, Helmut Rueger of Bonsai Rueger. In 1995, jointly produced a Bonsai exhibition at the castle in Buedigen, Germany with the above mentioned client. Currently holding annual workshops with several groups in U.K. most of which have been running over 2/3 years.